It’s the Friday after a new challenge launch and we love sharing a guest winner’s project with you. Today we have the lovely Karen joining us who was the winner of Jenny’s ‘Get some texture’ challenge. So without further ado let’s find out something about Karen and see the fabulous project she has made for us – an altered book. Hello I'm Karen Garrard from Winton Rose Paper Creations in Australia. 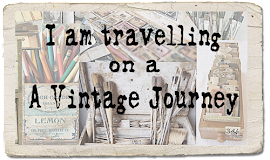 I am super excited to be Guest Designer here on A Vintage Journey. When I was told about Challenge #10 'Dies and Distress' I couldn't wait to get started. There's just so much you can do with the Tim's Distress Range. So many different finishes can be created. The dies make our lives so much easier and there's a wonderful selection of designs. I have always been fascinated with what can be created with paper. As a child I used to send a stamped self addressed envelope to the children's programs for the origami sheets, always asking my mother for another stamp. The only other crafty thing I remember having were cane baskets that I could glue lace onto. I knew I enjoyed creativity but in the back of my mind it would have to get A LOT better for me to continue with it. It wasn't until 2006 I got right into card making. 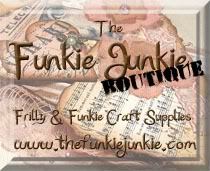 Then in 2010 I discovered the wonderfully talented Tim Holtz.....I know!!... call me a late bloomer. This AMAZING guy has bought vintage into my life, taken me back to a time way before I was even born, and I love him for it!!! THANK-YOU TIM!! From a very early age I have always been fascinated with antiques particularly from the Victorian/Edwardian times and am really pleased I can now create my own vintage looking pieces with all the wonderful tools we have available to us today. I decided I wanted a place to share my creations so started my blog in 2012, set up the spare room as my studio and have never looked back. I hope you enjoy the piece I have created here for you today. I would also like to extend a HUGE thank-you to Brenda and the Creative Guides for asking me to be guest designer. This is the front of my altered book. Firstly I cut the pages away to form two windows, one in the front and one in the back. Then I used Picket Fence Distress Paint for the base and added some tissue paper with Modge Podge. Then some stenciling with texture paste have been added before using the Distress Stains. This is one of the reasons I LOVE Tim's Distress Powders. Here is a metal plate with some brads and the bottom piece from the clip board die which I have added some embossing paste through a stencil. Then I added the distress powders. Thank you Karen for sharing your amazing project with us today, it’s a fantastic work of art and I for one will be hopping over to take a closer look at your process steps. Now onto the winner’s of Nikki’s challenge which was to use every stamp in a set. We had some fabulous entries as always and without further ado here are what Nikki and the Creative Guides chose for winner and pinworthy mentions. Nikki says - I love how Rosie has created this fantastic composition from Tim Holtz’s Classic #1 stamp set. The stencilled and inked background is wonderful and Rosie’s use of distress markers to colour some of the stamped images complements this beautifully. This is a beautiful piece Rosie, thank you so much for entering our challenges and you are the winner of the £10 shop voucher from our sponsor, Country View Crafts. Your project will be pinned to our winner's Pinterest board and will be invited to join us on an excursion shortly. 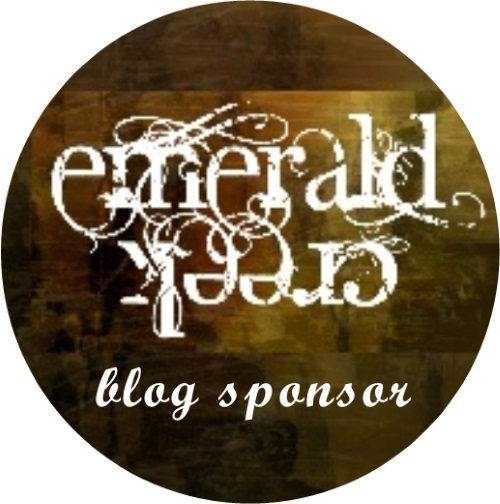 A blog badge is also on it's way. We also have three Pinworthy mentions and these projects will be pinned to our Pinworthy board and badges will also be on their way to you too. Thanks everyone for your support and continued travels with us on A Vintage Journey. We will see you Monday with another of our fabulous Guest Creative Guides, but for now enjoy Friday and the weekend wherever you are and whatever you have planned. Wow, I am sooo happy to be a winner !!! Thank you so much. Your altered book is just stunning Karen and your love of all things vintage really shines through! It is so lovely to have you share this beautiful piece with us here at AVJ too. A fantastic project Karen, I love everything about it, such wonderful vintage elements and you are so right about the embossing powders. Lovely to find out a bit more about you too! Big congrats to Rosie, a well deserved winner and congratulations to Jean, Claudine and Julia for their pinworthy projects too, brilliant work from all of you!! Congrats Rosie and all, thank you for picking mine for pinworthyness, I'm thrilled!! :) Wat a great project by Karen too, amazing!! And this is why I picked you Karen! Another work of art with so many clever details. The ideas of the distressed pearl balls behind the acetate and the pocket watch behind the globe are absolutely inspired and I love the care and attention to detail you've lavished on every element of this wonderful book. Thank you so much for joining us here with another stunner. Beautiful artwork, Karen, which brings me back in old times. I love all details! And congratulations for Rosie and your stencil take on this challenge! Congratulations also for the pinworthies! SO excited to visit today and find my bottle was chosen pinworthy!! Congratulations to Rosie and Jean and Claudine as well! and what a wonderfully repurposed book Karen! A stunning make Karen and it's lovely to have you here. It's clear to see that you are a huge TH fan and the projects on your blog are amazing too. Huge Congratulations to Rosie and our Pinworthies, Jean, Claudine and Julia. What a glorious creation from Karen - a fabulous offering for the Guest Designer slot! And congratulations to Rosie and the Pinworthies - all brilliant work! Karen your altered book is just amazing and such a wonderful project to share with us at AVJ. Love all the vintage goodness that went into this. Congratulations to Rosie and all the fabulous Pinworthy guests. and congratulations to Pinworthies too! Congrats to all the winners and thank you so much Karen for sharing this wonderful project with us.